Hub was going to KL for business and asked if I wanted to go. Of course I was game, provided it was a short trip. KL is the perfect example of a defective city. The prime grouse for any tourist in KL would be the lack of good public transport. The LRT, which runs above ground about the height of a 2-storey building, is a complete nightmare, a joke. The stations do not connect and you'll have to walk up and down and cross the road to get from point to point. KL taxi drivers are dishonest, especially the Chinese and Indians while Malays are the most honest (there you are, I'm a true Malaysian, racist about everything) and their standard excuse if you are taking a short ride is "The meter is not working" and for that they will charge you twice what you'd pay if the meter was working. I haven't tried the buses because I get weary enough already when I visit KL. One-way streets are prevalent in KL and that's a quick-fix solution that doesn't work. The only way to ease the traffic jam in KL (and KK) is if there is good public transport. Failing that, people have no choice but to drive. The roads in KL city are so maze-like and crazy that if drawn on paper, they will look like piles of fish scales, curving everywhere. I think it's a hopeless situation. Unless they bomb the city and start all over again, KL is a disaster. The sidewalk pavements are uneven and large sections are missing. I thought DAP would do a better job but then again I hear that they are having a hard time running the place as opposition administrators. Still, it is inexcusable that this basic amenity--good, even pavements--is not provided. The authorities should be made to walk around the city, especially at noon, to get a feel of what it's like for tourists. There are few trees and the tropical heat and humidity makes walking around the broken paths very torturous. So why go to KL? Oh yes, there's the Petronas Twin Towers, or KLCC. The KLCC is beautiful, especially at night, but there's nothing to explore in KLCC except for shops that sell hand bags at twice the price in Europe. KL's saving grace is its food. And so that was all we did: eat. 12 noon: We checked into our hotel and headed straight for 'mamak' (Indian Muslim food) food: chicken tikka, nasi bryani and chilled pandan coconuts, next to our hotel in the middle of the city. The memory card in my camera chose to act up just then, so no photos. 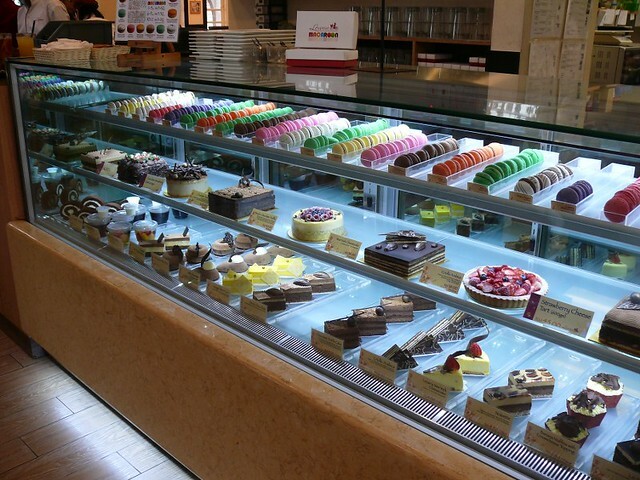 In the city, we always frequent the malls because that's where we can escape from the heat. The food court in Pavilion is Hub's favorite whenever he goes to KL because again, he wants to get away from the heat and that's the only place where he can grab a quick and cheap meal. 7 pm: My feet were killing me (Rockport wedges don't work) and it was either back to the hotel then or hang around and leave earlier. Hub suggested Jalan Alor for durians, the only place we knew for the fruit although I had my reservations because about 10 years ago, I was fleeced by a durian seller in the same spot and had an argument right on the street. I lost the argument because he started swearing in the foulest Cantonese I've ever heard but I just wouldn't cuss like him. Not that I couldn't. I'm Cantonese too. 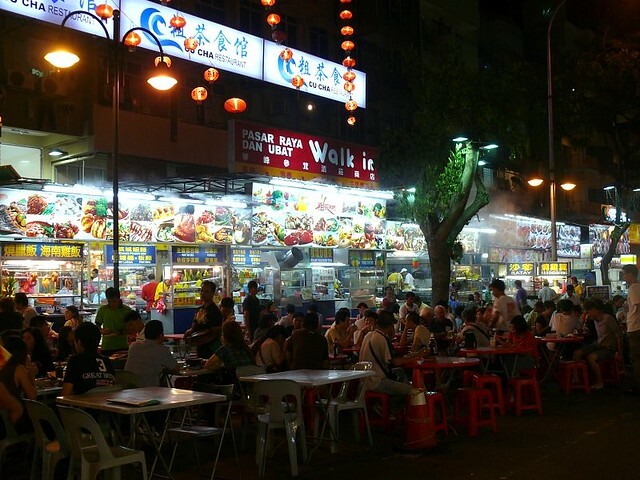 Jalan Alor is now even more busy that before, with tables and chairs spilling onto the road. The crazy thing was, the road was open to traffic and the side mirror of an SUV scraped my arm as it passed by, the driver indifferent to my shouting. I think Jalan Alor is a perfect example of how badly the city is run. Why is safety compromised, with both vehicles and restaurant tables on the road? The road isn't long and can be closed to traffic after office hours. Is that so hard to do? At the end of Jalan Alor are many Thai restaurants and the waiters who grabbed people off the street were all Thais,which was convincing enough to us so we sat down at the most populous restaurant. 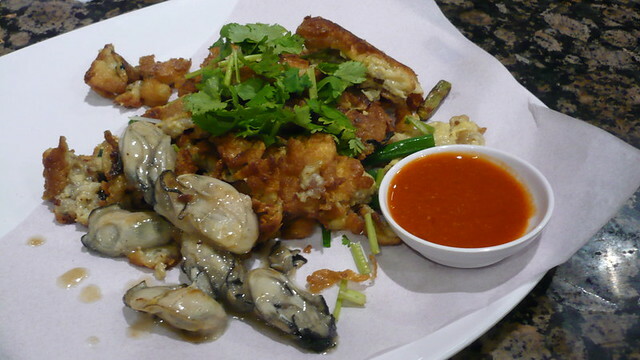 Fried kang kong (RM10) was very good. 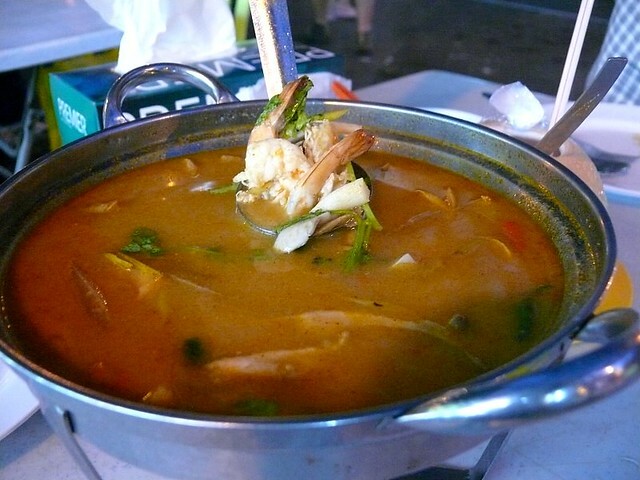 The seafood tom yum (RM18) was sweeter than sour, with very little seafood, a blah for us. 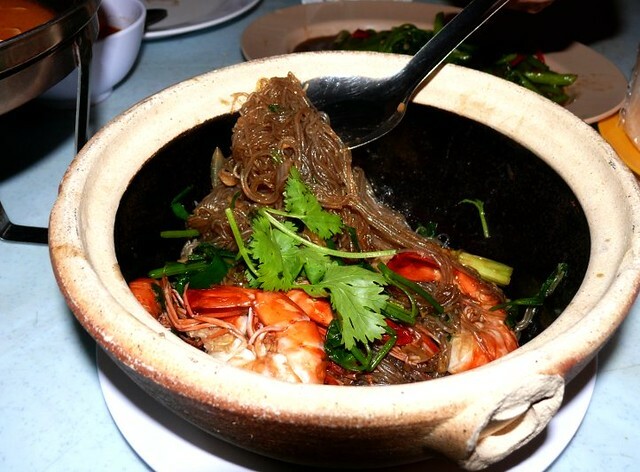 Glass noodles and prawns in clay pot (RM18) was more soy sauce-flavored. I liked it although Hub said it was too wet. Durians are not fully in season yet and we checked out all the 3 stalls and settled on the one by the Chinese restaurant at the entrance of Jalan Alor. The maw sang wong durian is currently the most sought-after variety and at RM28 per kilo, a little baby like this cost RM36. I was disappointed. This maw sang wong didn't taste as good as the one we had in Singapore. 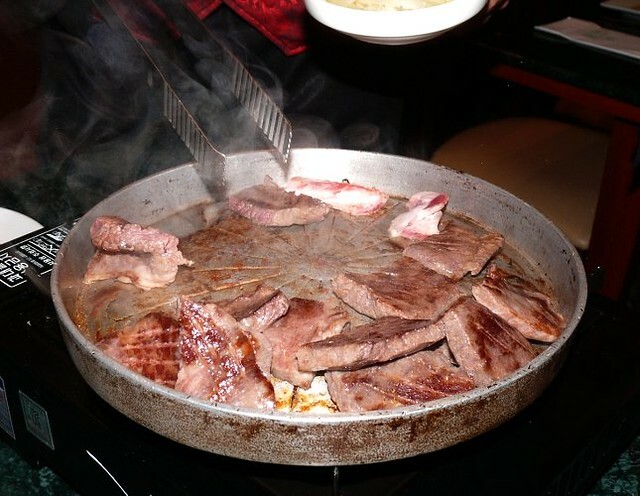 The flavor was intense, which was great, but the meat was squidgy and wet. Unlike most durian aficionados, I dislike bitter durians and this one tasted as bitter as bittergourd. The durian seller said that wet durians are always bitter while the drier durians are sweet. Would you like another one, he asked. I may be a fool once in a while but I'm not always an idiot so I walked away. We realized once again that Jalan Alor is a tourist trap. 9:30 am, next day: I wanted to re-trace my old working days where I used to stay in Park Royal Hotel and ate breakfast in a corner coffee shop called Mei Sin around Jalan Imbi. I especially craved their kuey teow soup with minced pork but of all days, they were closed. That was good news for Hub, because he wanted bak kut teh right across from Mei Sin. Secretly, I was relieved too because the restaurant and the area around it looked dingy and filthy, with garbage collectors doing their job at that hour in the morning. But it was too hot for boiling-hot soup and bak kut teh was not appealing to me in the morning. The congee looked good and can be digested quicker so that we can have lunch earlier, at the eating street in Pudu. We enjoyed this bowl of congee (RM30) in Restaurant Sun Fong which Hub said was like pau fun (soaked rice), cooked rice soaked in hot boiling water which my in-laws eat when their appetite is down and which my father ate whenever he felt under the weather. 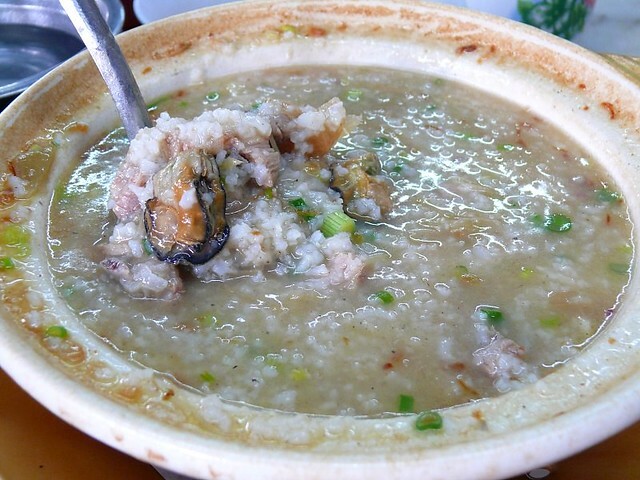 I don't like pau fun but this bowl of dried oysters and pork ribs congee was tasty. However, I think I made a mistake because everybody else was eating bak kut teh, which was half the price of the congee. And the congee made us sweat just as badly. 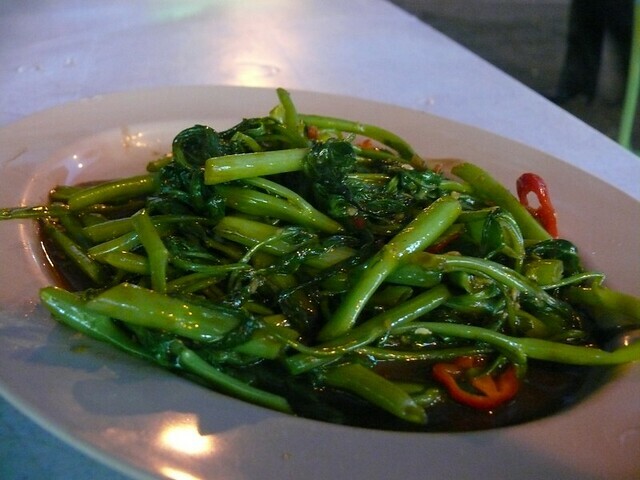 We decided that no matter how good the food is at sik gai in Pudu, we won't venture there in the boiling heat. 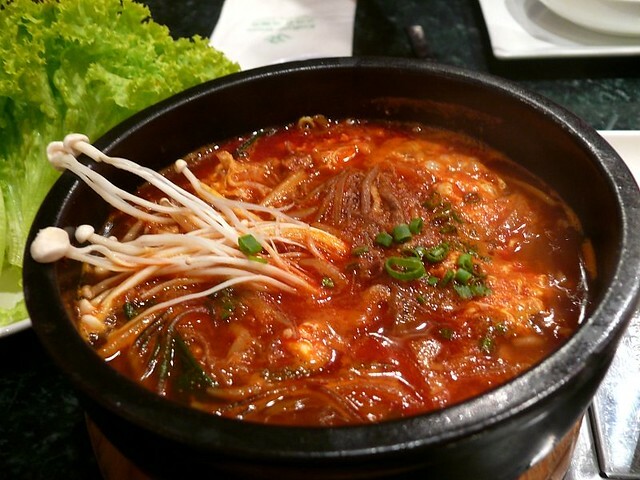 My fave Korean soup, yuk gye jang (RM30), was very satisfying. Hub may be warming to Korean food at last because this is the first time he didn't complain about it. Beef rib galbi, RM70, for two strips. 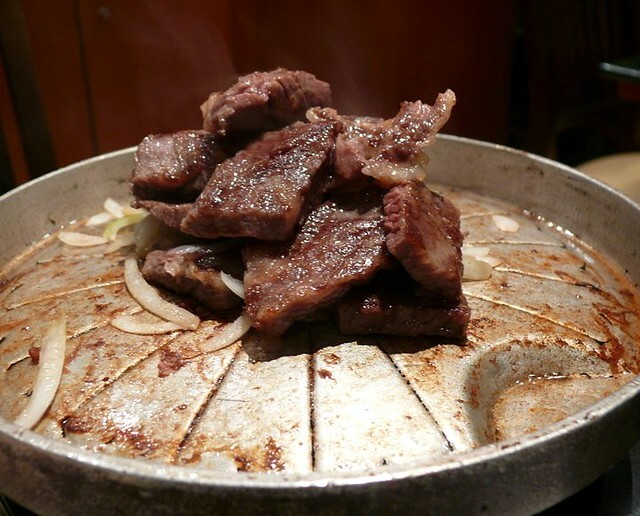 Although expensive, the galbi was buttery, tender, delightfully flavorful and delicious. I prefer them au natural, without marinade, dip or even the lettuce wrap. 2:30 pm: The April issue of Time Out from the hotel was great because it listed some of the best restaurants (according to them) in KL and this issue's focus was desserts. I checked out Su Yin's Delectable in Pavilion but unfortunately it was a take-out outlet only and there was no place to even stand to grab a bite and coffee. I was tempted to bring home one of her chocolate cakes but the buttercream wouldn't last the hour-long ride to the airport (KLIA is 80 km from the city, one of the furthest in the world, another stupid 'acclaim' if that makes the authorities feel better). 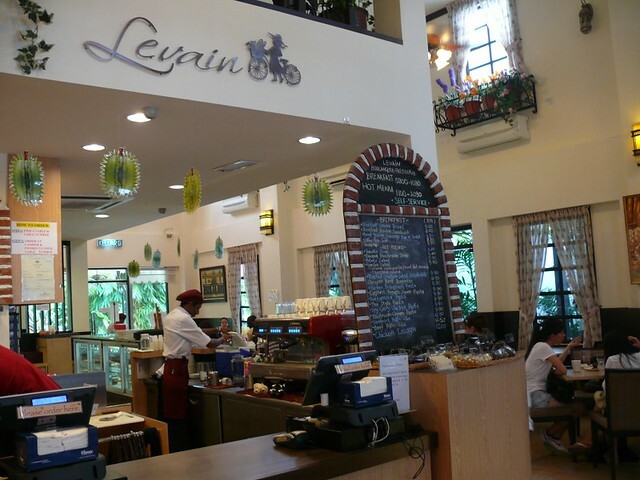 There were other cake shops that looked really good but they were far away in Bangsar or Sri Hartamas so we checked out from the hotel, took a taxi to 7 Jalan Delima and had coffee and cake at Levain, a bakery and cafe that operated from a bungalow that had clearly seen better days. 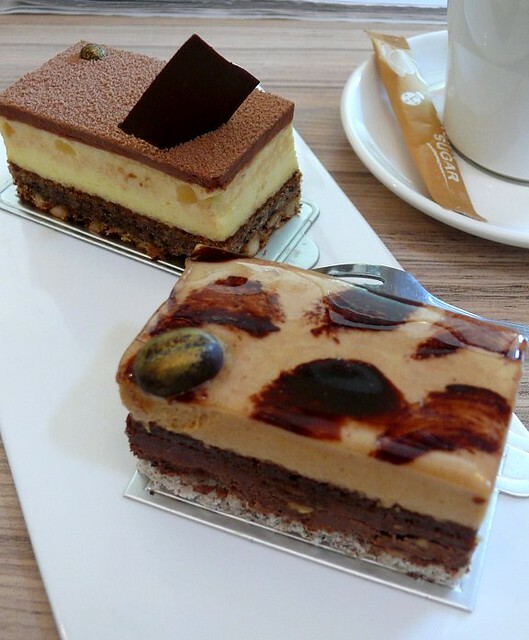 Not bad, but didn't convince me that the cakes here are some of KL's best. About RM8 each piece. At the airport, I bought two pieces of KFC chicken, hiding them from Hub because that's something I don't usually eat. I'm still wondering why I did that but if you look at the amount of food we ate in 30 hours, you'll know how badly and quickly the stomach rumbles the more you eat. Besides, there wouldn't be any food served on the new budget airline, Firefly. Speaking of which, I highly recommend Firefly. Nobody checks the hand luggage (unlike AirAsia) and the flights land at KLIA/KKIA. The planes are new, comfortable and the service is just like MAS'. In fact, Firefly is so much like MAS that the stewardesses slurred their announcements, especially the word 'gentlemen', just like all MAS flight attendants do. I'm just waiting for them to say "Firefry", like MAS girls say "We hope you had a great fright". Humorous, those girls. Next time you come down we'll haunt the malls...and i too wld rather eat at food courts...no sweat. ANd cheap. Frankly, if you ask me I really dont know where to eat in KL. i always end up in food courts. I think you know better. Yeah, agree. Imagine the horror of looking at the road structure of KL road from Google map, n loOk at Paris or even Singapore, it will make u laugh. guess it's true that what makes a place lovable is the food and it's people. And I absolutely loveeee the food at my old haunts in KL and my sweet old friends still living there. p.s. 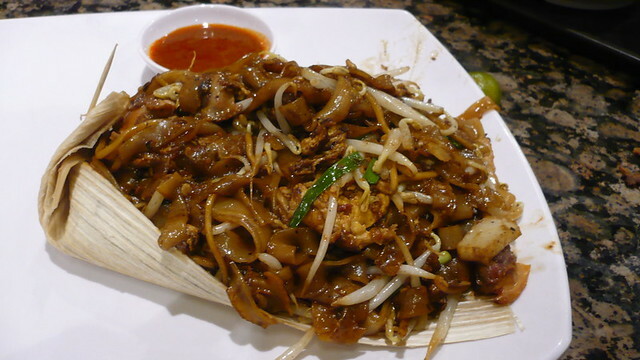 your oh-chien and char koay teow pics are making me drool so bad. Anyway, next time when you get to KL, drop me a note and I will tell you where to find best best food. Hehehehehee... or you can drop by my house for a humble bowl of asam laksa! Hehehehe..
wa! you ate a lots in 30 hours. i hope it's enough for two people. have u ever been to HK? Like a few others have commented, that was a lot of food between the two of you in 30 hrs. Still they look yummy!. Love the humour with this posting. ...after watching all these food, I'm hungry!!! 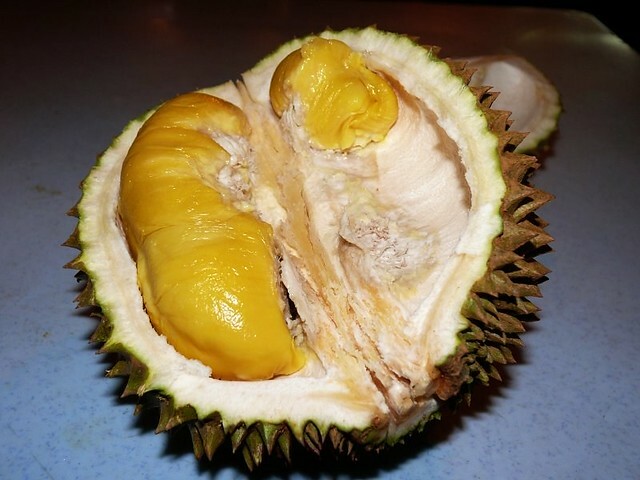 I really would like to taste a Durian!! I tried one here in my city last here, but it was not ripe...so I don't know how does it taste!! And neither how to recognize a ripe fruit!! I would like to wish you and all your family a HAPPY EASTER!! can i treat you n willaim to kfc when u come back:DD? food: tt's so frustrating. the biggest problem with this country is jobs are not given based on capability :( oh yes, i'll love to have ten bowls of your assam laksa! jim: i know...i'm suffering now, weighing the highest ever in ten years! simon: thnk you. visit yi this year? laura: you have to come visit us! LOL, you an entertaining writer. One thing I dislike about walking in the streets of KL is the fear of falling into an open sewer. The last time I was there, many manhole covers were stolen and we had to watch our every step! KL is indeed a defective city! But thankfully steps are being taken to 'correct the meters of the taxis' and make the buses more efficient! Love how much you managed to eat in just 30 hours!